Referee Craig Joubert will return to Twickenham to take charge of England against Wales in the 2016 Six Nations on Saturday, 12 March. The South African, 37, awarded a controversial penalty that gave Australia a 35-34 win over Scotland in the World Cup quarter-final. At full-time he ran from the field without shaking hands with the players. He will then be assistant referee for Scotland's final Six Nations match against Ireland in Dublin on 19 March. The game's governing body, World Rugby, said Joubert was wrong to award the 78th-minute penalty, which sent the Wallabies into the semi-finals. 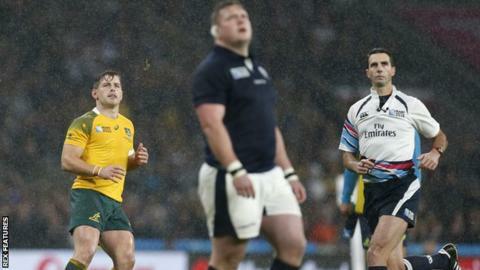 World Rugby said that because Australia's Nick Phipps touched the ball before Scotland's Jon Welsh was penalised for a deliberate offside, "the appropriate decision should have been a scrum to Australia for the original knock-on". England - who lost to Wales and went out in the pool stage of the World Cup - host Warren Gatland's side at Twickenham in the penultimate round of matches in the 2016 Championship. Wales' World Cup final referee Nigel Owens will referee the final game of the 2016 Six Nations between France and England in Paris on 19 March.